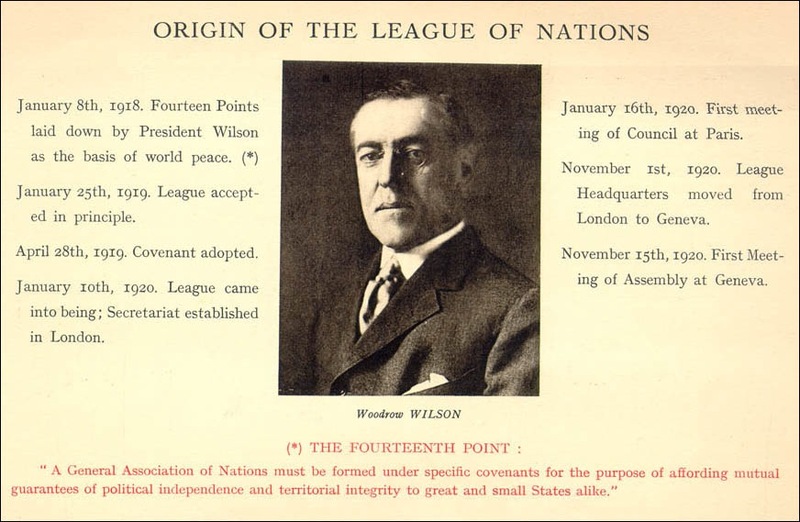 SWBAT: Describe Wilson's concepts for peace and the League of Nations and efforts to foster American support for it. Teacher will have students pair-share what they think the League of Nations is. Teacher will then inform the students what the League is and its main function. The teacher will then briefly review Wilson's Fourteen Point, which were covered in the last lesson, and specifically highlight number fourteen . Which points were about specific territorial issues in Europe and elsewhere? Why is Wilson pictured at the center of the card? Look at the text surrounding Wilson's image. What is its significance? Why is the Fourteenth Point printed at the bottom of the card? XIV. A general association of nations must be formed under specific covenants for the purpose of affording mutual guarantees of political independence and territorial integrity to great and small states alike. The League of Nations printed this card. How might the card's contents and design serve the interests of the League? Which nations were not members of the League? What were the basic tenets of the Covenant? Look at the introduction to the Covenant. Compare it to the Fourteenth Point. THE HIGH CONTRACTING PARTIES, In order to promote international co-operation and to achieve international peace and security by the acceptance of obligations not to resort to war, by the prescription of open, just and honorable relations between nations, by the firm establishment of the understandings of international law as the actual rule of conduct among Governments, and by the maintenance of justice and a scrupulous respect for all treaty obligations in the dealings of organized peoples with one another, agree to this Covenant of the League of Nations. Teacher will hand out the support documents and have the students pair up and fill them out together as well as work on their vocabulary squares. Students will complete the demonstrated learning portion of the lesson as homework. Students will participate in the lesson introduction through a pair-share activity and teacher led Q&A. Students will follow along with the teacher as they go over the Wilson picture and the League Covenant. Students will answer the questions listed above either in written or verbal form. Students will complete the support documents while working together in small groups. Students will write an essay comparing and contrasting the tenants of the Covenant of the League of Nations with the basic issues covered in President Wilsons Fourteen Points. The teacher will engage the students in a debate regarding whether on not the U.S. should have joined the League of Nations. The students will use the information collected from their notes and the supporting documents to back their points with fact.